Last week, David found Maggie, the Local Girl who has Mysteriously Disappeared, at his cousin Barnabas’ house, dressed up like the dead ancestor that he considers his closest friend. Yup, just the same old thing. Maggie pauses on the stairs, and David runs up to the bannister, yelling, “Josette, it’s me! It’s me, David! David Collins!” Okay, kid, it’s you; why are you screaming at me? You’re like six inches away. Now, the great thing about David as a character is that if a child behaved like this on any other show, he would either be out of his mind or he’d be possessed, in some creepy “red rum” type scenario. But David is actually comparatively sane, for a Collins. He has seen Josette’s ghost before, and talked to her. Naturally, nobody believes him, which makes Josette his Mr. Snuffleupagus. And in classic Snuffleupagus style, by the time Roger and Vicki show up, Maggie has drifted off into another room. Once again, they just make themselves at home, and then start lecturing the kid about respecting other people’s property. Barnabas comes home to find this family meeting going on in his drawing room, and he’s remarkably laid-back about the whole thing. They have a long chat about trespassing and ghost-hunting. 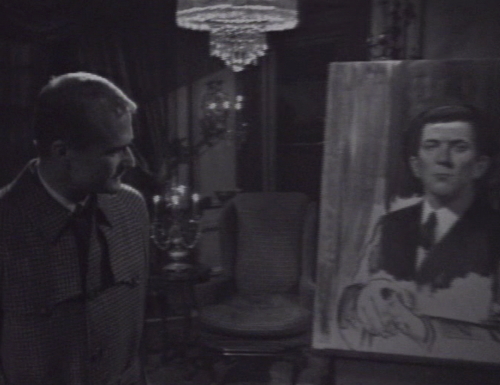 After running that conversation to a satisfactory conclusion, Roger admires the half-finished portrait that Sam’s been painting, and they’re off again on another subject. This might be the moment where the audience starts to sympathize with the vampire for the first time. I mean, yes, technically we’re on Maggie’s side, and presumably that means that we’re hoping she’ll wander into the room again and have a long chat with Roger and Vicki about her ongoing abduction. But instead, we’re thinking, for Pete’s sake, don’t these people have a home of their own to go to? It’s got to be past the kid’s bedtime; can’t you just push him out the door and start calling the all-night locksmiths? 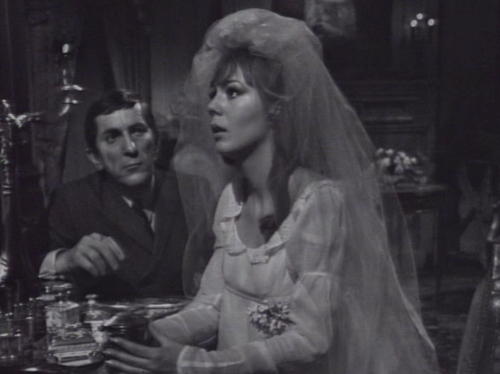 The uninvited guests finally clear the room, and Barnabas goes upstairs to find Maggie, who’s listening to the music box and staring at herself in the mirror. Barnabas has been using the music box as a hypnotic-brainwashing reinforcement tool, which is an interesting concept. This is partly an obscure reference to the 1931 Dracula movie. When Count Dracula is first establishing a hold on Lucy, she listens to a music box as she tells Mina about how romantic and fascinating the Count is. The music box gets a big close-up at the start of the scene, which implies that it’s important, and possibly a gift from Dracula, but nobody mentions directly that the music box is affecting Lucy’s mind. The real source for this plot point is the fear of “brainwashing”, a term which was first used in the early 50s, during the Korean War, to explain why a number of GIs captured by the Chinese defected to the other side. 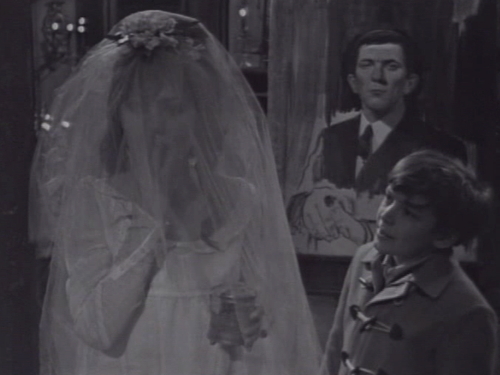 Here, Barnabas’ hypnotism seems to be mostly based on isolation and repeated commands; he wants Maggie to keep listening to the music box and repeat to herself that she’s Josette Collins. Remarkably, this seems to be working. 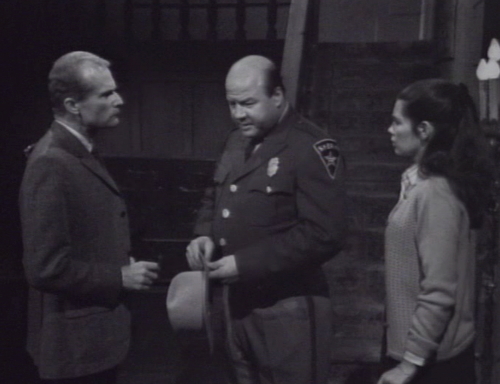 Then another uninvited guest stops by — poor dejected Sheriff Patterson, who’s come over to check up on Willie. 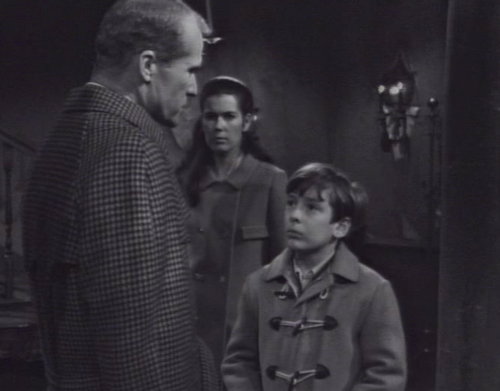 Patterson asks about the night that Maggie disappeared, and Barnabas gives an extremely shaky alibi, saying that he sent Willie to Bangor that evening. Naturally, Patterson doesn’t show any interest in asking follow-up questions or confirming this with anybody in Bangor. Barnabas says that Willie didn’t do it, and that’s good enough for Collinsport law enforcement. 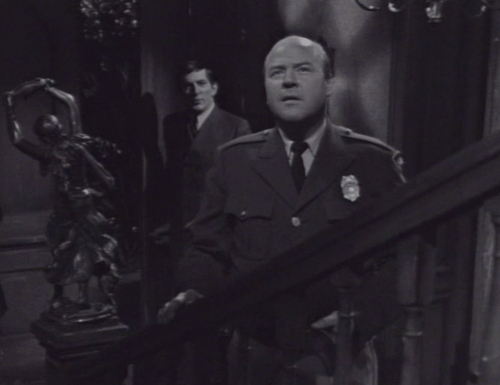 On his way out, Patterson hears the music playing upstairs. Barnabas explains that he’s restoring an old music box, and hustles the sheriff out. Barnabas might want to consider locking that front door if he’s determined to leave his captives unsupervised like this. Patterson also swings by Collinwood to give Roger and Vicki the big news that they aren’t making a lot of progress in Maggie’s case. He whines, “There’s nothing I can do. I have no lead. I have no clue.” Which pretty much says it all. Tomorrow: A Mystery in Science. At the end of the Barnabas/Maggie scene in Josette’s room, there’s a loud clank offscreen. David tells Vicki about that “Josette” cried when he was talking to her, and when he asked why she was crying, she cried even more. This didn’t happen; I don’t know what he thinks he’s referring to. In the 1931 Dracula movie shot you have included on this site, it sure looks like Sy Thomashoff found inspiration in the decor of the bedroom to use as Josette’s room, doesn’t it? What is Barnabas’ end game once Maggie is a vampire? Does she just wander around town pretending to be the great granddaughter of josette? Does she just listen to the music box in the old house forever? He’s got family and neighbors walking straight into the main room of his new home day and night. I think every single cast member has made it into the house since kidnapping Maggie; lots of close calls. I guess he thinks vampires make their own luck. Making a late enquiry – why does the sheriff feel the need to go to Collinwood to tell Roger and Vicki that he’s made no progress? (Well, he was in the neighborhood… ) But wouldn’t it make more sense if he went to Sam Evans and told HIM? Y’know, Maggie’s FATHER?